Darien's Lindsay Bennett (5) bumps the ball in the girls Class LL Semi-Finals volleyball game between Southington and Darien high schools, Wednesday night, November 14, 2018, at Shelton High School, Shelton, Conn.
SHELTON — The Darien volleyball program has such a long history of success that three years without a trip to the state final can seem like an eternity. So make no mistake about it, this group of Blue Wave players is ecstatic to be going back to a championship game. Darien and Southington played a five-set barn-burner with the Wave pulling out a 3-2 victory in the CIAC Class LL semifinals Wednesday night in Shelton. Darien won by scores of 27-29, 26-24, 25-23, 19-25, and 15-12. The win puts No. 12 Darien (18-7) in the championship match against No. 10 Amity (17-5), which shut out Westhill 3-0 in the semifinals. The final will be played at 10 a.m., Saturday, at East Haven High School. It’s Darien’s first trip to the state finals since 2014 when they defeated Cheshire 3-0, and the Blue Wave seniors in particular couldn’t be happier. 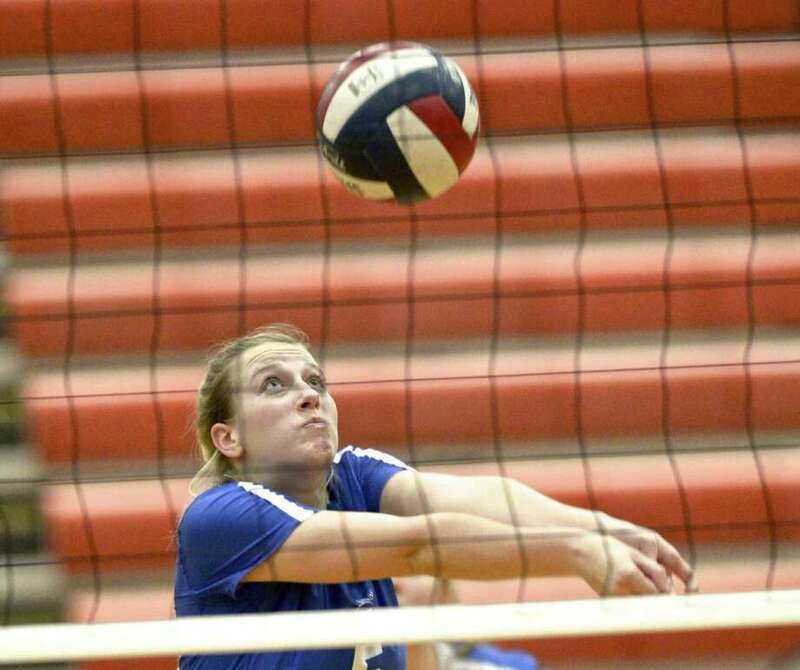 Midway through a fourth-set win for Southington, the Wave were able to make a serious momentum shift. The top-seeded Lady Knights (21-2) were dominating in that frame and led by 11 points at 17-6, but Darien regrouped and closed the gap to four at 23-19. Here’s match point from Darien’s 5-set victory over top-seeded Southington in the Class LL@girls volleyball semifinals. Although Southington eventually won and tied the match at 2-2, the Wave’s late run gave them some confidence going to the fifth set. In the decisive frame, Darien had the better of play early and led 7-4, but the Knights charged back and grabbed a 12-11 edge. With their season on the line, the Wave went on one last run. Bennett scored on back-to-back points to put Darien ahead, and the Wave took the next two points for the match win. It’s Darien’s second five-set win in the states — they topped Newtown 3-2 in the second round — but prior to the state playoffs, they had lost six of seven matches which went the distance. The result was a lot of work in practice and new found confidence. Darien had plenty of credit to go around. Escajadillo steered the ship as setter, racking up 36 assists, with Bennett posting a team-high 14 kills to go along with 14 digs. Junior Hassana Arbubakrr was a force at the net with 14 kills and nine blocks, many of them in key situations. Defensively, Elaina Cummiskey and Sophia Tralwalkar each had 16 digs. Darien rebounded from the first-set loss and went ahead 9-3 to open the second frame. Southington rallied to tie the score at 18-18 before gaining a 22-20 lead on the strength of a couple of kills from senior co-captain Haley Larrabee (16 kills, 21 digs). The Knights then moved to set point at 24-23, but the Wave survived as a strong hit from Bennett tied it. After a Southington error put Darien in front, Arbubakrr ended the set at 26-24 with a booming kill. Darien was three points from losing the third set but again rallied. The Wave scored four straight points, taking a 23-22 lead on a Bennett kill. After the Knights tied it again, Darien won the final two points for a 25-23 win. The set was nip and tuck all the way, as the two teams were tied 12 times.